Stanley Kubrick’s 1960 filming of Spartacus, a job he took over from Anthony Mann at the behest of Kirk Douglas, is one of the pantheon widescreen historic epics of the 1950s and 1960s. Its story of a Roman slave revolt led by gladiator Spartacus (Douglas) has sweep and majesty, yet retains an intimate feel in its development of the relationship between Spartacus and the slave Varinia (Jean Simmons) who bears his child. The film never surrenders to false heroics and bears an ending that invokes both sorrow and inspiration. An impressive cast that also includes Laurence Olivier, Charles Laughton, Peter Ustinov, and Tony Curtis subsumes itself to the story very effectively. The film’s original three-hour-plus length was cut for theatrical re-release, but later restored in a well-documented 1991 restoration effort by Robert Harris. That restoration has been the basis for several previous home video releases of Spartacus on DVD and high definition. On DVD, the 2000 release by Universal was quickly superseded by a 2001 release from Criterion – a version that Harris endorsed as addressing the film’s colour timing and image density correctly. In 2006, Universal gave us an HD-DVD version that offered a strongly saturated image, but little else of merit. The image looked dirty at times, with annoying digital artifacts and wavering colour intensity, and was widely panned by critics. That same mediocre transfer was re-issued on Blu-ray in 2010, for the film’s 50th anniversary, and again more recently. Fortunately, Universal has finally seen fit to give this film the proper, all-new restoration it deserves for the digital age. The result has just been released on Blu-ray Disc… and it’s simply stunning. The Spartacus: Restored Edition is vastly superior to any of Universal’s previous Blu-ray releases. Colors are rich and accurately reflect Kubrick’s theatrical presentation of the film. The level of detail visible here is actually quite surprising. Some shots are a little soft looking, but on the whole the image is wonderfully crisp and clean. Fine detail and texturing on such things as the leaves of olive trees, stonework, and fabric is impressive. Contrast is also satisfying, with deep blacks and good shadow detailing. This presentation isn’t perfect, but it’s close and for a film of this vintage – and given its somewhat troubled presentation history on disc – it’s a damn impressive restoration. The film’s original 6-track audio has been remixed for the first time in 7.1 and is presented here in lossless DTS-HD Master Audio format. The soundstage is surprisingly big and wide, and especially full-sounding when Alex North’s orchestral score kicks in. Dialogue is clear and clean at all times. The surrounds are used mostly for atmospheric fill and music, but every once in a while you’ll start hearing the clash of swords and other effects ringing out from the rear channels. There’s good bass support here too. This mix offers a very nice sonic match to the restored imagery (note that French DTS 5.1 audio is also included, as are subtitles in English SDH, French and Spanish). The Blu-ray includes a pair of all-new special features, starting with the Restoring Spartacus featurette (9:00 mins), which details the effort to produce the new presentation, which was scanned in 4K from the original “large format” 35mm Technirama negative. As mentioned above, Robert A. Harris and Jim Katz did the original 1991 photochemical restoration work with Stanley Kubrick, and they were brought back in to consult on this new digital restoration. They’re mentioned briefly in this piece, but it’s Universal personnel who are featured here, including Peter Schade (VP of Content Management), Seanine Bird (Restoration Project Manager), and John Blum (Re-Recording Mixer). It’s also explained that in 1991 the original 6-track audio was restored but this is the first time that 5.1 and 7.1 audio mixes have been created. Also newly-included for this Blu-ray release is I Am Spartacus: A Conversation with Kirk Douglas (9:39 mins), which is a new retrospective interview with the legendary actor looking back at his work on this film and his memories of its making. As some of you know, Douglas suffered a stroke in 1996, so his speech is a little hard to understand (Universal has included English subtitles to illuminate his thoughts). But what he has to say is well worth listening to – it’s clear this role means a great deal to him. Douglas also talks about his brushes with the House Committee on Un-American Activities and the infamous Senator Joe McCarthy in the 1950s. In particular, Spartacus screenwriter Dalton Trumbo was hauled before Congress at the time, and Douglas claims that it was his hiring of the writer for this film that helped to break the blacklist. 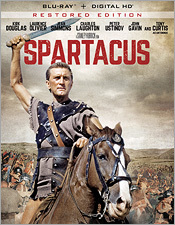 Beyond that, all of the previous Blu-ray extras have carried over here, including 4 deleted scenes (7:41 minutes in all – the US and UK versions of the Spartacus Meets Varnia scene, as well as the 1967 Finale, and the audio recording of Gracchus’ Suicide), archival interviews with actors Peter Ustinov (2:57 mins) and Jean Simmons (3:43 mins), Behind the Scenes Footage (5:10 mins), 5 vintage newsreels (4:59 minutes in all – including London Ovation, Tony Curtis Honored, Sir Laurence Olivier Returns to Hollywood, Kirk Douglas Honored, and Kirk Douglas Arrives in New York), an HD image gallery (of Production Stills, Concept Art, Costume Designs, Saul Bass Storyboards, and Posters & Print Ads), and finally the film’s theatrical trailer in window-boxed SD (2:45). It’s taken a good long while to see Spartacus given its due on Blu-ray, but at last it has. While it might be a hard swallow for some fans to purchase yet another version of this film on disc, make no mistake about it: This is the version to own. Making it a little easier is the fact that the SRP for this release is just $19.98, which means you can get it for as low as $15 on sale. Plus, the newly-restored picture and sound – and the new bonus content – should help ease the sting a good deal. Highly recommended.